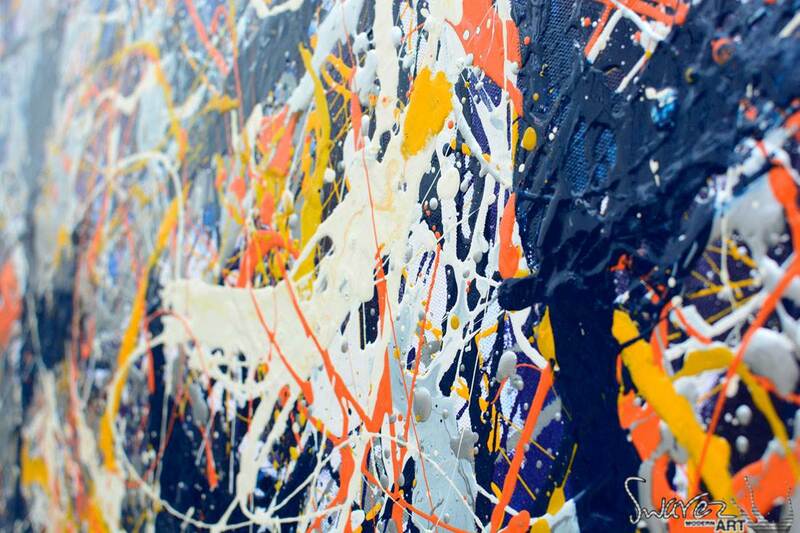 This is a drip painting inspired by the Jackson Pollock masterpiece called Blue Poles. This is a slightly more abstracted interpretation but is so painstakingly researched and put together that I doubt there’s anything else like it anywhere. I’ve dedicated nearly a year to creating two unique replicas of Pollock’s original. 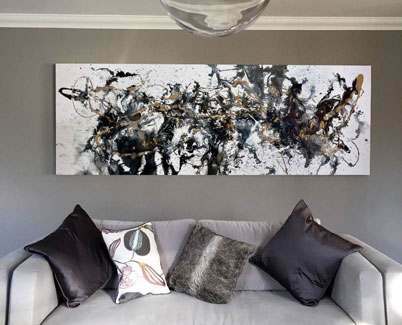 £17500 for a drip painting? Yes, that’s right. 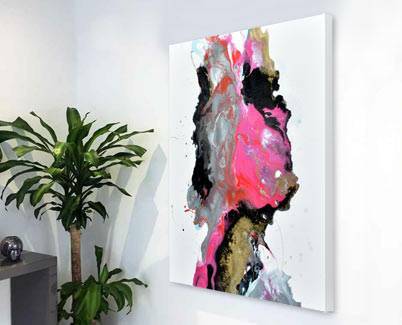 And it’s a snip for this authentic and beautifully crafted original drip painting. It’s very, very special. And here’s why. 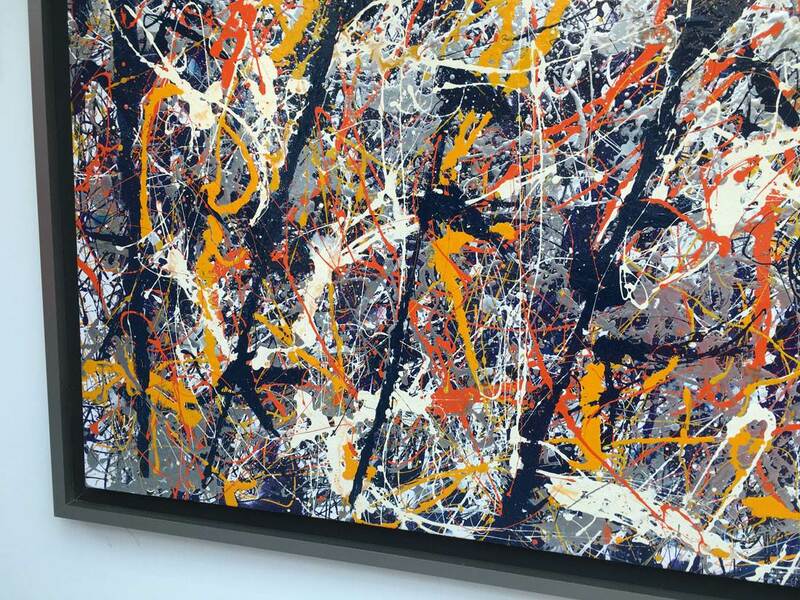 It’s actually a recreation of one of the greatest abstracts of the 20th Century – Blue Poles by Jackson Pollock. 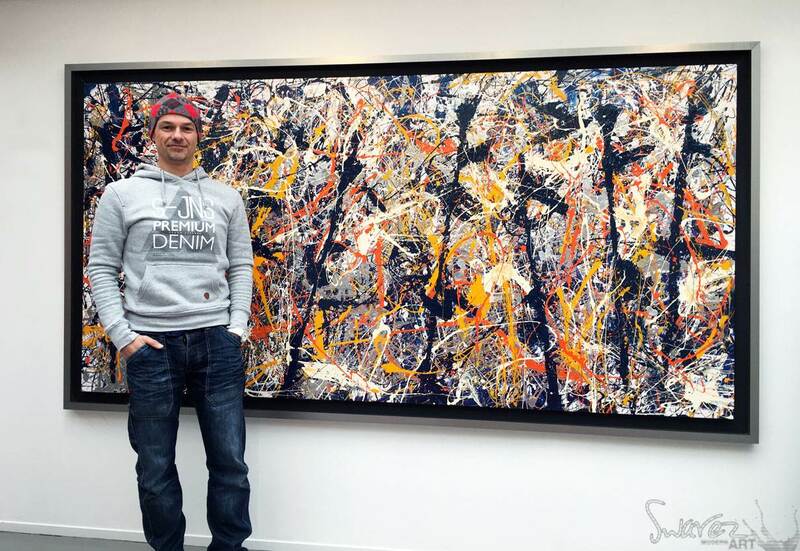 I painted two versions over the course of 2015/16; one has gone to a Pollock collector in Ibiza and this is the other one. It’s also the slightly more abstract of the two (which I prefer to be honest). 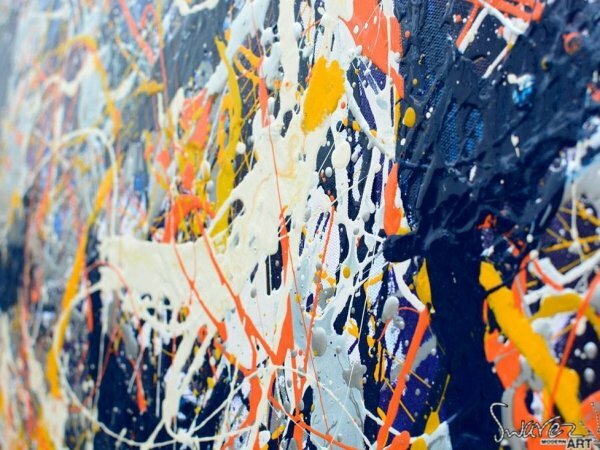 I have written extensively about recreating the materials Pollock would have used and also the deconstruction process and subsequent painting sessions. 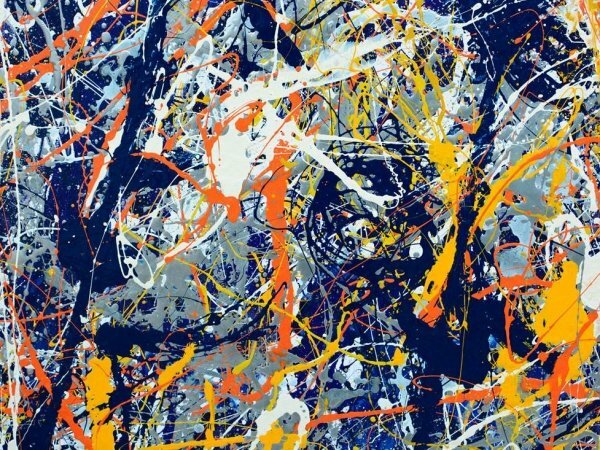 If you haven’t read it already I strongly urge you to go read the definitive guide on how I recreated Pollock’s Blue Poles. Then come back and finish off the story with this one. The project was always about being faithful to the original. This has meant hours of research and hours of painting. Too many really. 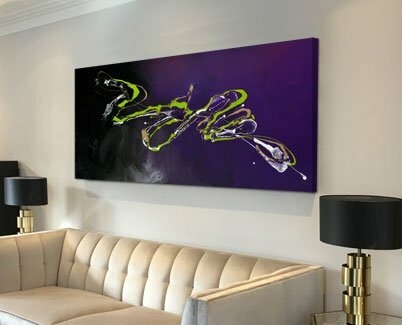 Every part of the painting has been carefully picked apart in my head, every stroke and layer has been considered and the techniques used for drip painting (the way Pollock would have done it) have also been replicated. I have tirelessly researched his paints and managed to reproduce the aluminium silver he used, I’ve kept with Belgian linen for the canvas and even included turkey basters in my line up of tools. No-one will ever really be certain how Jackson Pollock painted the original Blue Poles. Scholars, scientists and academics have theorised and concluded many things over the years. For me, as someone who has actually had a go at recreating his techniques and processes, I can say (with a degree of authority) that he would have returned to the canvas repeatedly over some considerable time to get it the way it looks today. It was definitely a long term thing for him as it has been for me. 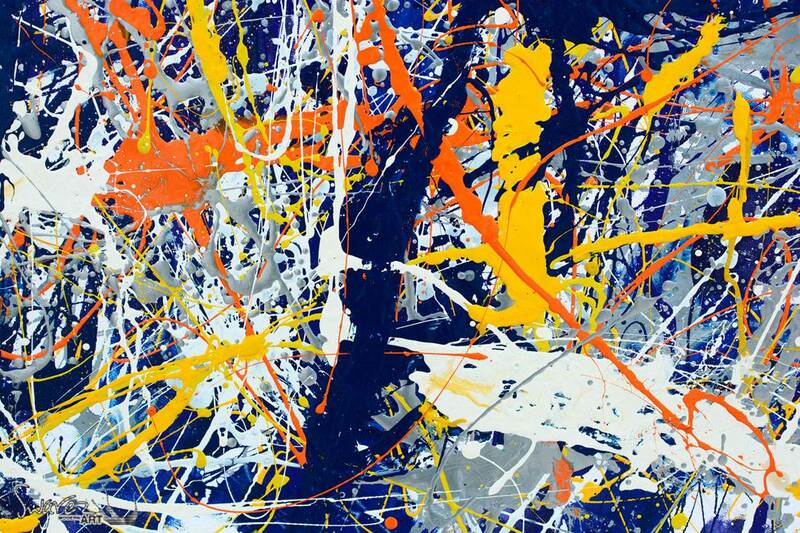 I would like to think I’ve come the closest of anyone to understanding how Pollock created Blue Poles. After all, how many academics have done what I’ve done? How many scholars got dirty with a dozen paint cans? How many experts learned about enamel paints? I cannot say for certain but I would imagine I’ve got closer to what would have been in his head than someone with a text book and a magnifying glass. Enamel paints have certain qualities that cannot be rushed if you’re trying to achieve certain things. 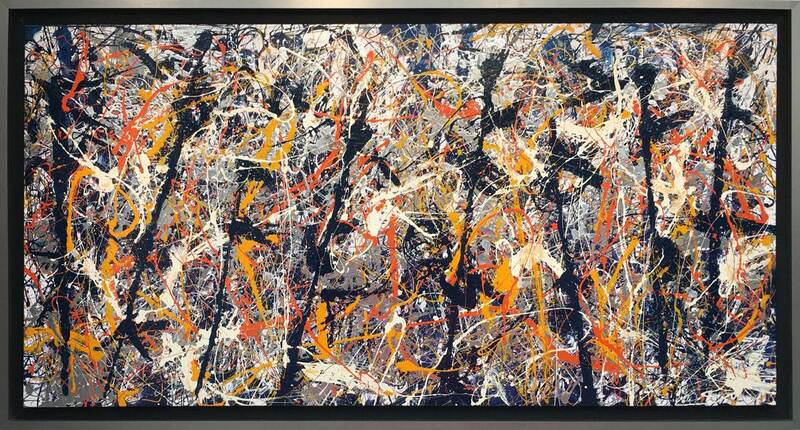 Pollock’s line structures, his ability to overlay paint and control his wrist movements were exquisite and finely honed. They are things you need to feel to be able to understand. As a painter I appreciate the tiniest nuances and changes he would have made in order to get some of the finishes you see in his work. And so his level of detail has become the stuff of legend. In order to recreate this kind of ‘painting-within-a-painting’ I have had to learn and practice new techniques and make some subtle changes to my paint structure. But it’s a success and I love what I’ve done. I have pushed my own boundaries and I cannot ask any more of myself than that. 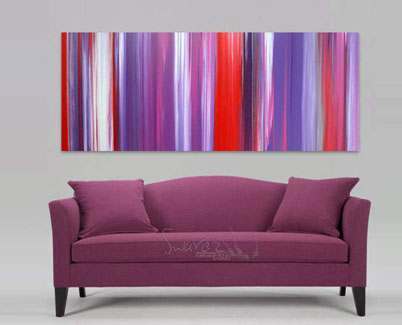 A serious painting for a serious collector? Yes, I think it is. Whilst you may appreciate the effort that has gone into creating it it may not be something you’d ever want to own. 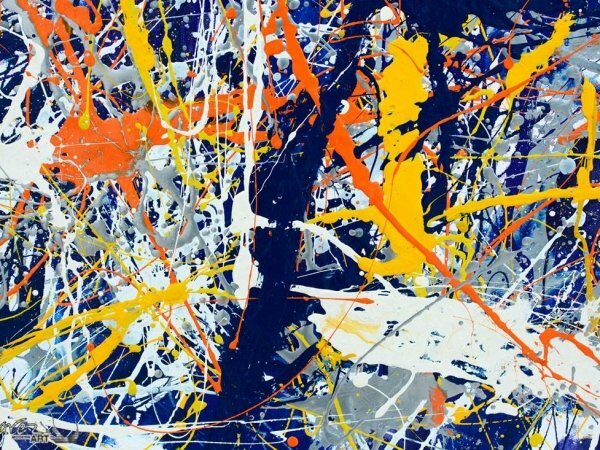 You may not like drip paintings or the work of Jackson Pollock and that’s just fine. However, if you do, then this is probably going to be of great interest from a number of perspectives. 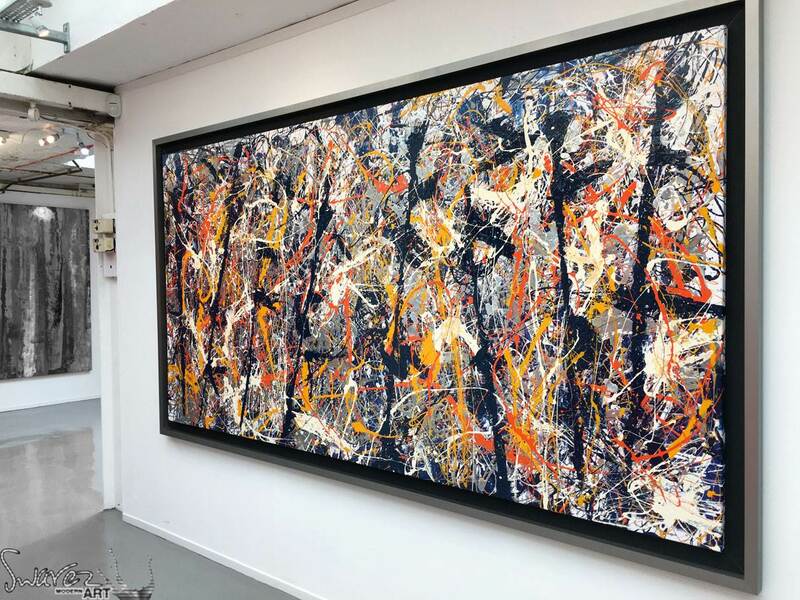 The person that buys it will not be buying a rip-off of the original or a plagarised attempt to steal Pollock’s thunder. Instead they will be buying an accurate and sympathetically created drip painting based on one of the most important abstracts of the 20th Century. It is unique and (to the best of my knowledge) I have yet to see anyone else, anywhere, have a go at recreating something based around Blue Poles. Probably because it’s too bloody difficult. Evidently then, you CAN put a price on that. And, for the only one in existence, it’s an absolute steal. 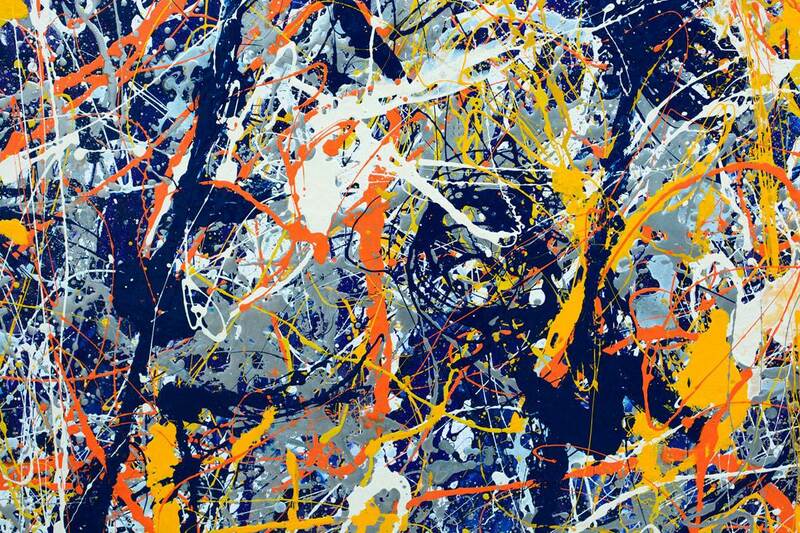 If Pollock’s original, originally sold for $32,000 in 1957 and is now worth several hundreds of millions of dollars, what’s yours going to be worth in 60 years??? A sound investment me thinks!